It's often argued that it is reasonable to believe in the resurrection of Jesus because of the historical evidence in its favor. That's a mistake. We have a mountain of comparable evidence, much more actually, that there were real witches at Salem, Mass in the 1690s. We should reject the resurrection for the same reasons we don't think the Salem Witches were real. We can see from cases like the (false) believers at Lourdes and others that humans are really, really unreliable when they report miracles. 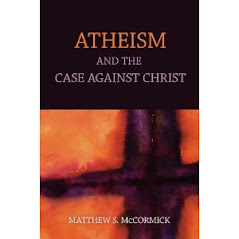 Furthermore, the early Christians would have been highly disposed to believe supernatural claims about Jesus, they were ignorant of a wide range of psychological facts about humans and their religiousness, and the Jesus story has been filtered through a long process with the goal of promoting belief. I argue that these layers of doubt undermine the output--the resurrection story we now have. And we should not believe it. Does God Want Us to Believe Miracles? It's clear that the Christian miracles, when viewed from a distance are really crummy miracles. An all powerful, all knowing, and all good God with the various goals that Christianity has attributed to him could have and would have done a much better job. Here's a number of ways to perform better miracles, for God's next attempt. The argument: 1. If God had sought to ground Christianity on the New Testament miracles, we would expect them to be much better in several ways. 2. Since they are so poor, we have to conclude that God did not or does not want us to believe on their basis. So that suggests that Christianity is based on a grand mistake. How's that for three days work? Great work. I usually refer to the Indian rope trick when dissing the physical resurrection but I like the reference to the Salem witch trials. Hey Matt, how did the debates go? Will they be posted anywhere? The debates went well, I think. Of course, when believers go to these things, they walk away thinking that believing was clearly vindicated and the non-believers think the opposite. But as far as I can tell, the arguments I am presenting wreak havoc on Russell's defense. I have become much clearer about the grounds of many people's beliefs through all of this, especially his. We have some video but I haven't been able to upload it yet. I'm working on it. Got a publication deadline for the end of the week. Thanks for asking.